In the Orthodox Church, for most of the services, a person called the Reader stands at the front and, well, reads what needs to be read during the service. The services are compiled from at least three different books depending on the day of the year and how the church calendar cycles works out. Basically, there’s a lot of books and they are all used during every service. 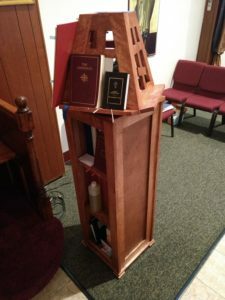 So churches have dealt with this preponderance of books in various ways, but one of the more striking ones is a rotating book stand. The Reader Stand, if you will. Its basically a narrow bookshelf with a rotating book rest on top. Before the service starts, you open all the books you need to the various pages, lay them out and then just spin the top to get to whatever book you need at the moment. It works pretty well and looks much nicer than metal music stands loaded up with 3-ring binders. 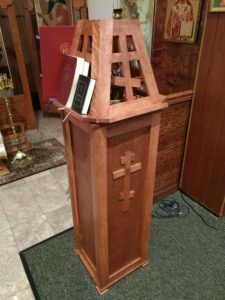 My church has wanted one for a while, but alas, Orthodox church furniture is not a huge industry in Arizona. Anyone making them is located far away (most are not even in the US) and selling them for many thousands of dollars. And so my priest turned to me and said, “I want you to build this.” I avoided it for about a year, but in the end one does not argue with his priest, even if one feels like he’s in a little over his head. I made it with birch hardwood with birch plywood. I made two 3D SketchUps, three miniature and two full-size models before I got the angles right. That shape is called a Frustum, by the way. Seems appropriate. 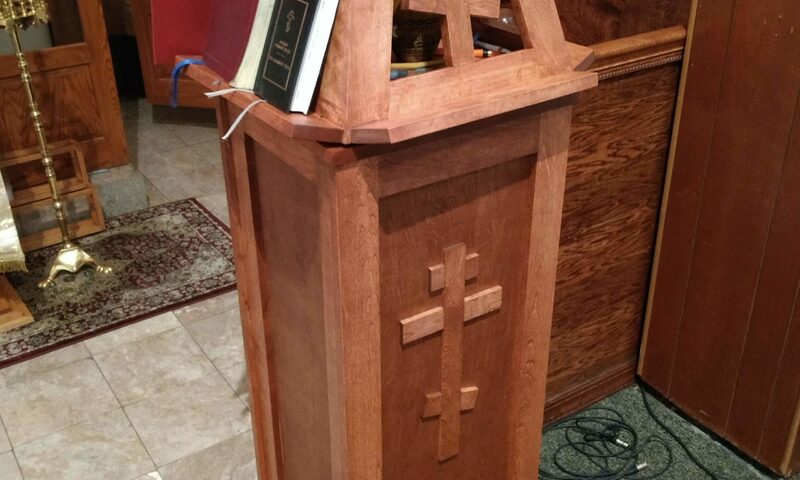 As soon as he saw it, the Reader said “It’s missing the top bar on the cross. That’s going to bug me.” He means the cross in the book stand section. I hadn’t considered that there are one bar crosses and three bar crosses, but not 2 bar crosses. “I’m not rebuilding it,” I replied. He’s right. It does look better with that third bar. 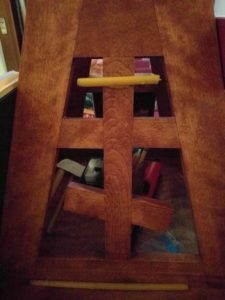 Anyone want to buy a 99% complete reader stand?